Michael Aaron Einziger (born June 21, 1976) is an American musician and guitarist and co-songwriter of the rock band Incubus. Einziger uses pedalboard guitar effects during live concerts, and was voted #41 in Total Guitar's top 100 guitarists of all time in 2002. In an interview with Gibson Guitars, writer Steven Rosen states "[Einziger] hasn’t played the guitar so much as he has manipulated it, submitted it to his own needs. Einziger fashions a sonic tapestry that draws heavily from the Zappa/Vai/Hendrix school of rock." Mike is also an active composer, writing his first full-scale orchestral concert entitled "End.>vacuum", as well as "Forced Curvature of Reflective Surfaces"; an experimental composition that was featured at the "West Coast, Left Coast" Festival at Walt Disney Concert Hall. He co-wrote and played acoustic guitar on Avicii's 2013 worldwide hit "Wake Me Up". Alongside this, Einziger co-wrote and played guitar on David Guetta's "Lovers on the Sun". 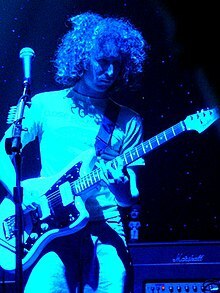 Mike Einziger performing live with Incubus. Einziger co-founded Incubus with Calabasas High School classmates Brandon Boyd, Jose Pasillas II, and Alex Katunich in 1991. Incubus has sold over 13 million albums worldwide and has been nominated for 2 Grammys, MTV music video awards, American Music Awards, mtv U Woodie Award, and the Billboard Awards. Incubus has performed sold-out concerts at The Hollywood Bowl, The Great Western Forum, Madison Square Garden, Radio City Music Hall, Wembley Arena in London, and Araneta Coliseum in Manila, Philippines. Outside of his work with Incubus, Einziger founded his own project Time Lapse Consortium in 2003. The group featured Incubus musicians Jose Pasillas II and Ben Kenney (who was not a member of Incubus at the time), Neal Evans of the band Soulive, and long-time collaborator Suzie Katayama contributing string arrangements. The band had their debut show at The Roxy in LA, and would go on to play Jimmy Kimmel and the Knitting Factory in New York City. In 2003 Einziger contributed to Ziggy Marley's debut solo album Dragonfly alongside fellow Incubus member Chris Kilmore as well as Flea and John Frusciante of Red Hot Chili Peppers. Einziger composed the soundtrack for the 2001 film Sol Goode, which was released later in 2003. Einziger also expanded into the realm of video games when he and his bandmates worked on the soundtrack of the popular game Halo 2, writing a 26-minute song that also featured Flea on trumpet. In 2006 Einziger produced the debut album "Red Rover" by Agent Sparks; a collaboration with younger brothers Benjamin Einziger and Paul Fried. In 2007, Einziger produced Nighttiming, the debut album of long-time friend and former Phantom Planet drummer and actor Jason Schwartzman's Coconut Records project. The album featured appearances by Kirsten Dunst, Zooey Deschanel, and Robert Schwartzman, and was recorded at Einziger's own home studio in Malibu, CA (Casa Chica). Einziger began crafting an orchestral composition “End.>vacuum” following surgery in March 2007 for Carpal tunnel syndrome, a repetitive-strain injury to his left wrist undoubtedly due to a lifetime of playing guitar. The condition forced him to take a hiatus from the band and his instrument. It would be the longest he’d ever gone without playing, and enabled him to follow some other musical, as well as outside, interests. The piece consisted of nine musical movements (approximately 40 minutes total) and was performed by a chamber orchestra led by renowned Los Angeles conductor and Einziger's longtime collaborator Suzie Katayama. Inspiration has been attributed to such iconoclastic modern and avant-garde composers as Igor Stravinsky, George Antheil, George Crumb, Samuel Barber, Krzysztof Penderecki and Frank Zappa. End.>vacuum was Einziger's first original orchestral composition. It debuted at UCLA’s famed Royce Hall on August 23, 2008. On Saturday, November 21, 2009, Einziger participated in the premiere event of the West Coast, Left Coast festival titled "EUREKA!". Einziger performed his latest musical endeavour, a piece called "Forced Curvature of Reflective Surfaces". Forced Curvature was inspired by a combination of the physical appearance of the Frank Gehry-designed Walt Disney Concert Hall, and Einziger's studies in the field of quantum mechanics. The music was written for 12 electric guitars (played with a slide), 12 strings (violin, cello), and is based on the glissando. The instruments have been orchestrated in terms of corresponding high and low registers, that reflect each other as though being viewed through a mirror. The exterior shape of Disney Hall informed the shape of the sounds created and by necessity, was first drawn visually in the form of architectural-like renderings, before being committed to paper in the form of a hand-written score. "[Disney Hall] is obviously a solid, immobile structure, but it looks like a series of reflective waves that have been frozen in a specific state at a specific place in time, and I wanted to try and imagine what it might sound like if that idea were to be expressed as waves of sound. Adding a 4th dimension of time to the picture would force the structure into a Minkowskian space-time manifold, and it would therefore become directional. It would be as though time itself were forcing the curvature of the reflective material in a forward-motion, because time appears to be directional." The piece has no apparent formal structure and has been through-composed. All of the instruments will be fused together, forming 2 distinct 'mirror images'. The strings and guitars combined will not sound like separate groups of instruments, but rather as dense units of a single instrument uncharacteristic of entirely one or the other. Einziger conceived of the piece at Harvard University where he was a student 2008-2011. Einziger has studied the history and philosophy of physics with physicist/historian, Dr. Peter Galison, of Harvard University. He has a profound interest in the physical sciences. In 2008 he contributed to an article on the topic of human evolution with evolutionary biology figure and Brown University professor Dr. Kenneth Miller. On June 17, 2008 Einziger took a personal tour of the Large Hadron Collider at CERN in Geneva, Switzerland with British physicist Dr. Brian Cox. During that visit, Einziger invited Dr. Cox to appear as a speaker at his concert for "End.>vacuum" later that Fall. In 2009, Einziger orchestrated and recorded the additional strings for the Thirty Seconds to Mars third album This Is War. In 2012 Einziger began working with progressive house artist Avicii on the EDM producer's latest studio recording "Wake Me Up!" for his debut studio album True. Einziger helped premiere the song live at Ultra 15 along with bandmates Jose Pasillas, Ben Kenney and country music legend Mac Davis. As of July 2013, the song was ranked No. 1 on the charts in 39 countries. Einziger will be working music for The Amazing Spider-Man 2 with Hans Zimmer, Pharrell Williams, Johnny Marr and David A. Stewart. Mike has cited his early guitar influences as Jimmy Page, Jimi Hendrix, John Frusciante, Steve Vai, Paul Fried and Frank Zappa. He claims "infatuation" with Björk's voice. Mike was also heavily influenced by the music of Black Sabbath and Metallica. Einziger was born in Los Angeles, California. He is of Jewish descent. Beginning in 2008, Mike was enrolled as a special student studying music theory at Harvard University. In August 2017, Mike welcomed his first children, twin girls Penelope and Telulah, with wife Ann-Marie Calhoun. Early on, Mike was playing Ibanez guitars, and sometime around the making of Enjoy Incubus he switched to PRS (Custom 24's). On the albums "Science" and "Make Yourself" he used a Mesa Boogie Tremoverb. Mike used PRS McCarty Archtop guitars while recording some songs on the album Make Yourself (for example the song "Make Yourself"). On the album Morning View, Mike only used his PRS McCarty Archtops. During the A Crow Left of the Murder... tour, he started playing Fender Jazzmaster guitars. This guitar is played most prominently on the Alive at Red Rocks DVD. On a recent tour he has been seen using a Gibson SG Junior with P-90's modified with an extra neck pickup and a pickup selector switch. In 2012 Mike switched to Music Man Albert Lee sig. guitars and began running lighter strings(down to 9's after running 13's for many years) because of his need to find a more "comfortable" guitar for touring. He's stated this has been necessary since developing, and having surgery for, Carpal Tunnel Syndrome. Einziger is a multi-instrumentalist, and in addition to guitar, he has played piano, Mellotron, pipa, analog synthesizers, Fender Rhodes, Wurlitzer, and many other instruments on his recordings with Incubus as well as his other projects. He has also played a Jerry Jones Guitars Master Sitar on "Nowhere Fast" from the Make Yourself album (live, he simply plays the sitar part with his guitar), and a Pipa on "Aqueous Transmission". Mike also plays electric piano on songs like "Here In My Room" and has played piano on live versions of "Drive." He commonly uses Mesa/Boogie Trem-O-Verb 2/12 Combos, Fender Twin Reverb. Uses Electro-Harmonix Micro POG Polyphonic Octave Generator for the solo section on “Promises, Promises.” On title track, “If Not Now, When?” Einziger plays a Mellotron mandolin. Has a 1930s Gibson with a smaller body and used an older Martin acoustic when recording “Defiance.” In the video for “Adolescents.” he is seen with a custom PRS guitar which was sold at a charity auction for $15,000 and was borrowed from the buyer for the video shoot. Stopped using PRS guitars after some issues arose with a particular employee of Paul Reed Smith. A detailed gear diagram of Mike Einziger's 2000 Incubus guitar rig is well-documented. ^ Rosen, Steven (2008-04-16). "The Zen Guitar of Incubus' Mike Einziger". Archived from the original on 2008-06-22. Retrieved 2009-11-12. ^ "Incubus' Mike Einziger Discusses The Making Of Avicii's 'Wake Me Up' (a top story)::Avicii News". antiMusic.com. 2013-07-18. Retrieved 2014-07-15. ^ "KCRW'S WORLD FESTIVAL". Laphil.com. 13 August 2009. Retrieved 2009-11-13. ^ "Nighttiming - Coconut Records | Credits". AllMusic. Retrieved 2014-07-15. ^ Beth, Mary (2008-08-20). "Mike Einziger's Vacuum Chamber Music | Classical and New Music | Los Angeles | Los Angeles News and Events". LA Weekly. Retrieved 2014-07-15. ^ Hochman, Steve (2008-08-23). "Incubus guitarist Mike Einziger's 'End. > vacuum' to premiere at UCLA's Royce Hall". Los Angeles Times. Retrieved 2009-10-28. ^ Joffe, Daniela (2008-03-19). "Evolution: The forbidden Love Triangle Between Faith, Science and Charles Darwin". Archived from the original on August 17, 2009. Retrieved 2009-11-13. ^ Wolfe, Alexandra (August 3–4, 2013). "Michael Eizinger". Wall Street Journal. ^ "Marc Webb, Hans Zimmer Form Supergroup for 'Amazing Spider-Man 2'". Hollywood Reporter. 2013-10-31. Retrieved 2014-07-15. ^ Jin, Frances (2008-09-17). "15 Q's With Mike Einziger". Retrieved 2009-06-10. ^ a b "Incubus: 'The Gravity Of Our Friendship Drove Incubus Back Into The Studio' | Interviews @". Ultimate-guitar.com. Archived from the original on 2011-08-28. Retrieved 2012-03-07.